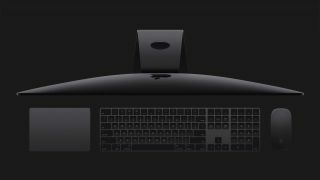 Apple exec says iMac Pro is so different it's like a new product line. The wait is almost over – Apple's eagerly anticipated ‘workstation-class’ iMac Pro is due to launch on 14 December. Pushing further into pro territory than any device before it, the iMac Pro has been completely re-engineered to feature an Intel Xeon processor – and the firm claims it will be Apple's most powerful product yet. The new iMac Pro is great news for video editors, in particular. Shipping with the robust W-series 8, 10 or 18-core Xeon processor (rather than the Core i5 and Core i7 chips in current iMacs), it promises better performance when working with complex data – be that 4K video, 3D or huge Photoshop files. This won’t come cheap, of course. In June, Apple said that prices will start at $4,999. T3: So, iMac Pro. Obviously there’s a new Mac Pro on the horizon. Could you give us some insight into why you’re doing that now? Phil Schiller: First of all, we care deeply about our Pro customers. Always have, always will. We love that so much is created on Mac. One of the things we’ve learned over the last few years is the depth of love and loyalty for Mac OS by our Pro customers. And Pro is a very large term. It encompasses many different people with different needs. It's probably one of the biggest groups of software developers, creating apps for iOS or web Unix-based software. It’s really popular on the Mac. It's video editing, it's music creators, it's photographers, designers, graphic designers. It's architects, it's scientists, it's professors at university. So Pro is a very large category of customers that have different needs. What we find is, across all of our Mac products, we have a lot of pros on MacBook Pro; we have a lot of pros on iMac; and we have pros on Mac Pro. And so, a number of years ago, when we talked about where we need to move all our products forward for pros, we knew that there was an iMac need there. It’s fairly large, and previously what we’ve always done is to create and push the boundaries a little bit on the configuration of your iMac. You could get a little faster processor, more storage, that sort of thing. And that’s worked well up to now. Inside it really is a different computer. Its incredible display, its beautiful design that floats above the desktop, and its compactness, and all the things we love about iMac. It’s almost like another line, the iMac Pro. We invested in creating this additional thing that pushes iMac further up north into pro territory than anything we’ve ever done in an all-in-one desktop, because the customers are already there. This is how long it’s taken. It was a big, big project, and that’s just how things go. It takes this time. And we’re getting close to when it’s out there. It’s very soon. A matter of days now. And like all of our products, we have a lot of thoughts and feelings about it, but the truth will be: what do customers tell us? I can’t wait. They’re using it. They’re applying it and telling us what things it’s best at, and where they get the most value from it. And we’re all going to learn together once it’s out there. It’s going to be the fastest Mac we’ve ever made. This is always the most exciting moment. It truly is. A whole new product. Nobody’s used it yet in the real world, and they’re about to, and what are we all going to learn? That’s probably one of the most fun moments in any product launch that we have. And it’s going to be the fastest Mac we’ve ever made. And that’s really cool, too, because our customers never cease to be amazed with the incredible things they can use these products for if you just give them the tools they need – and speed is among the list of tools they need. How does Apple as a company think about the iPad Pro and the Mac now – do you think about them as complementary? Or is the iPad Pro a replacement product? Phil Schiller: What we’ve learned, truthfully, is that it’s both, and that depends on the user. For some people, iPad Pro is a replacement for their computer. Not that you throw away your computer. People don’t often do that. But in that it becomes your primary computing device. The way you mostly hear about this is when people say, "I use a computer at my desk or I use a Notebook at my desk, but when I travel, I travel just with my iPad Pro. It is so great in that situation." Or you’ll hear a customer say, "I spend more time with my iPad Pro because the tasks I use it more for are the things I spend the most time in" – whether it’s surfing the web, looking through photos of your photo library, checking and triaging your email quickly. So for those customers, the iPad has become their primary device. But they don’t think of it in their brains as competing with their previous computer. It’s just the computer they spend the most time with. And then there are other customers who augment their computer experience. They use their computer a lot, but they also use an iPad for a task that it is clearly far better for than their computer. I think that people love to watch movies and TV shows on their iPad more than they do on a computer. People like to read on their iPad better than on their computer. There are certainly going to be customers that choose that this is their next computer purchase in their life. They don’t even like to call it a computer. It’s just: “I want to get an iPad, and I’m going to do more things on it. I still have a computer.” It’s almost like they’re making a distinction between the two, even though the uses are overlapping, and one is replacing the other frequently. It’s an interesting thing. The words are important. People don’t necessarily like the word 'replace' when they’re making these choices. But in reality, they are spending more time on it. And what about Apple Pencil? PS: Pencil, after AirPods, maybe be the second product that I hear customers say is their new favourite Apple thing – the iPad’s Pencil. Because again, it’s such a simple device. A simple, solid, clear, very focused purpose, and yet, the technology behind that is incredibly advanced, and it enables artists to draw, paint, do whatever they want for creation, and we’ve just seen a tremendous response to that from designers who work with it. And also, I’m seeing more and more professionals and university students use it for note-taking and annotating documents, whatever, and really enjoying that experience. Now, is that a replacement for a computer? Is that an augmentation? I don’t know. Let them use whatever words they want. But they just like using it a lot. And so I think it’s not complete to talk about iPad Pro without also talking about Pencil.